The photograph shows the Abenaki filmmaker on one of several trips she took to Moose Factory, Ontario, to make her first documentary: Christmas at Moose Factory, released in 1971. She pulls a group of children from behind her by the hand, looking back over her shoulder as they run after her in their boots. Obomsawin and the children were playing a game: they ran fast in a big circle, holding tight to one another’s hands. When Obomsawin first learned that the mural would be created, she said right away that she wanted children to be a part of it. The next day, she remembered that Moose Factory photo, taken by Ben Low. Obomsawin asked that the mural include it. “All my life, if I do what I do, it’s because I wanted to make a better place for children, especially in the educational system,” Obomsawin told the Nation. A rich variety of sounds is layered over shots of the children’s artwork: dogs howling and birds calling, Christmas tree decorations tinkling, plates clamouring on a dinner table. The sound heard the most: a howling wind. Obomsawin chose to make her first film in Moose Factory because she wanted to work with children in a residential school, in a remote place that was difficult for others to visit. Over the course of several visits to Moose Factory, Obomsawin stayed at the Horden Hall Residential School. She spent her days with the children in the classroom – telling them stories and teaching them lullabies and songs. During recreation time, they ran and played together in the yard. Many children were far away from their homes, their parents on the Quebec side of James Bay. At noon, Obomsawin often visited Inuit children in hospital suffering from tuberculosis. Obomsawin returned to Moose Factory – to screen her first film, and later to film part of her 2014 documentary about Treaty 9, signed in 1905, titled Trick or Treaty? During one of those later visits, a white-haired woman approached Obomsawin and asked if the filmmaker recognized her. Obomsawin replied no. The 1960s and early 1970s were a time when songs, drums, traditions and ceremony were “in the process of disappearing” in Ottawa’s home community of Manawan, she said. Obomsawin visited Manawan at that time. Ottawa remembers her aunt telling her about Obomsawin’s visit to the school. Obomsawin asked the children there to gather around in a circle and sang to them while playing her drum. “My aunt told me, ‘It was the first time I had ever seen anyone sing with a drum,’” Ottawa said. Ottawa has loved art and cinema her whole life – she made films with her mother’s camera and walked around her community “acting like a journalist, asking people funny questions in the street,” she said. 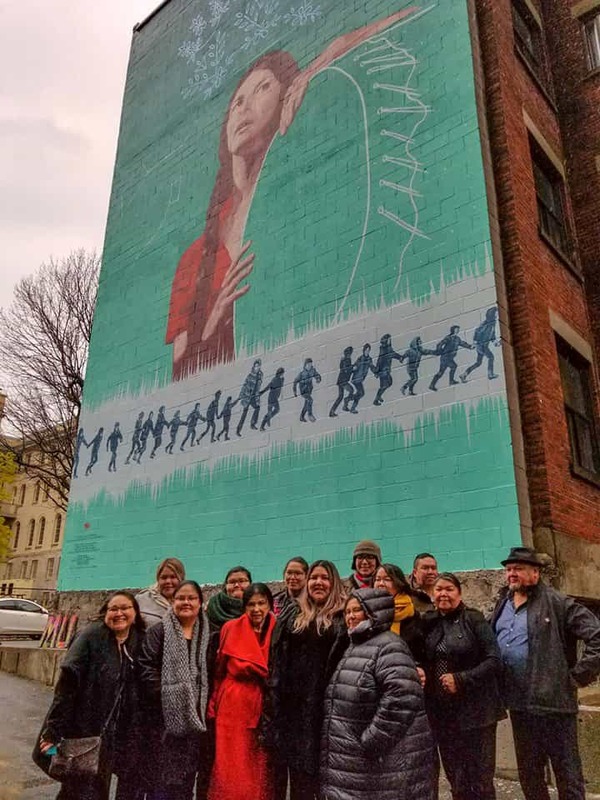 When she learned that she had won the competition to create the Obomsawin mural, the largest she had ever worked on, it made her extremely happy.